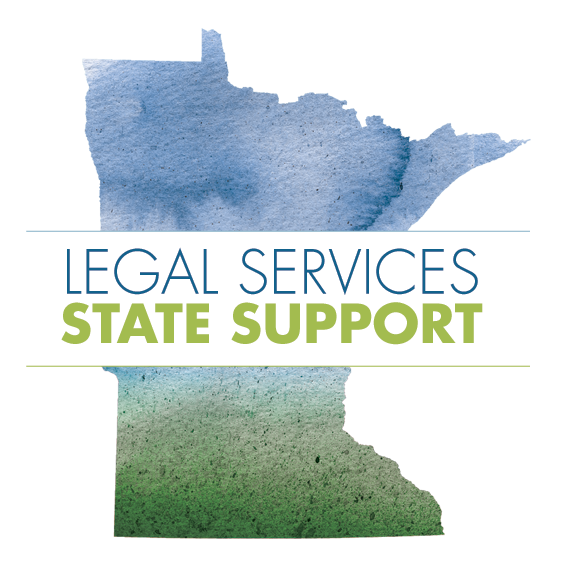 Throughout 2018, State Support worked to create a centralized portal of legal services available in Minnesota– the Legal Organizations Online Network (LOON) – and a redesign for the LawHelpMN.org website. 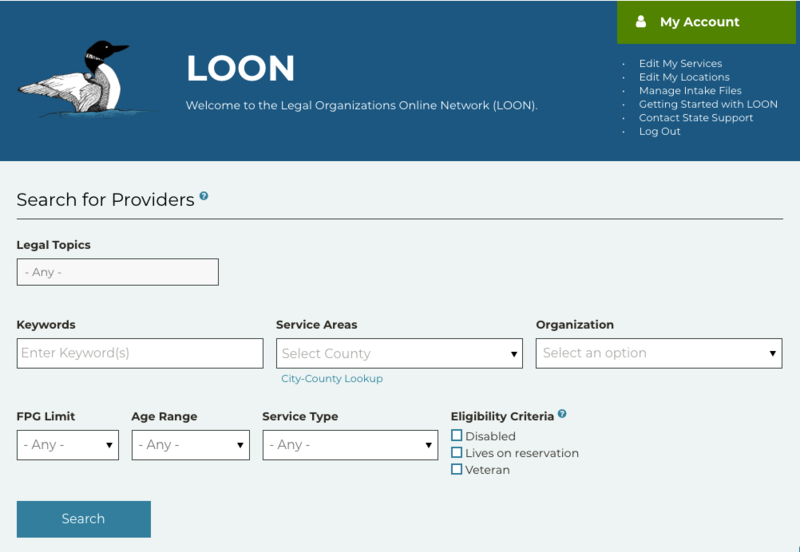 Both LOON, which launched in October 2018, and the redesigned LawHelpMN, which launched on Feb. 1, 2019, leverage Open Referral’s data standards to ensure clients receive more accurate information about the legal resources that are available to help them. These projects were made possible by the Legal Services Corporation Technology Innovation Grant, National Center for State Courts Justice for All, the Minnesota State Court Technology Fund, and the Minnesota Legal Services Advisory Committee. LOON is a detailed database of legal services organizations in Minnesota. The information is structured according to Open Referral’s Human Service Data Specification, enabling an increased level of detail in service listings without sacrificing a user-friendly interface. Legal service providers use LOON to update information about their own services in real time, and they also consult LOON when making referrals to other services. A user-friendly search interface allows staff to search various criteria to locate the most appropriate services for their clients. The newly redesigned LawHelpMN.org features the LawHelpMN Guide, which uses a series of simple questions to guide users to the best self-help resources and legal services for their situation. A user begins by answering questions, guided through branching logic, to reach a narrowly defined legal topic. After receiving self-help resources about the topic, the user may then proceed to answer more personal eligibility questions. The system then queries the LOON database, matching the user’s legal topic and eligibility criteria with available services. When State Support began planning its LawHelpMN redesign, one of the top priorities was to improve the accuracy of referrals. The previous organization directory had insufficiently detailed information about the case types legal organizations accepted. In addition, it was difficult to present information about an organization’s services when different services had different eligibility criteria. On top of that, we maintained a completely separate list of legal clinics, which were not associated with the listings in the organization directory. The result was that a single organization might have separate “organizational” listing for each office and each specialty service, as well as listings in a separate clinics calendar. This was both confusing to users and difficult to maintain. 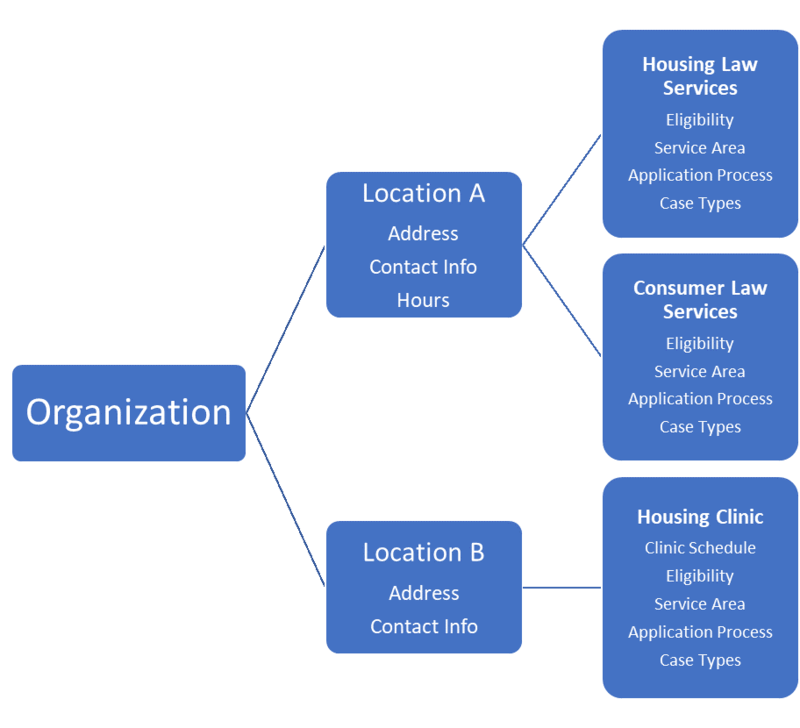 To fully transform our existing data about legal services organizations in Minnesota into the Open Referral format, we also needed to create a legal topics taxonomy. This taxonomy has become central to both LOON and LawHelpMN. Every self-help resource and each service or clinic is tagged with one or more legal topics. Once users narrow their legal issue via the first section of the LawHelpMN Guide, their issue is assigned a “legal topic ID” based on the taxonomy. Any self-help resources tagged with that legal topic are presented to the user as the resulting self-help resources for the entered criteria. This legal topic ID is also used in tandem with eligibility criteria to determine which legal services might be a good match for the client’s situation. 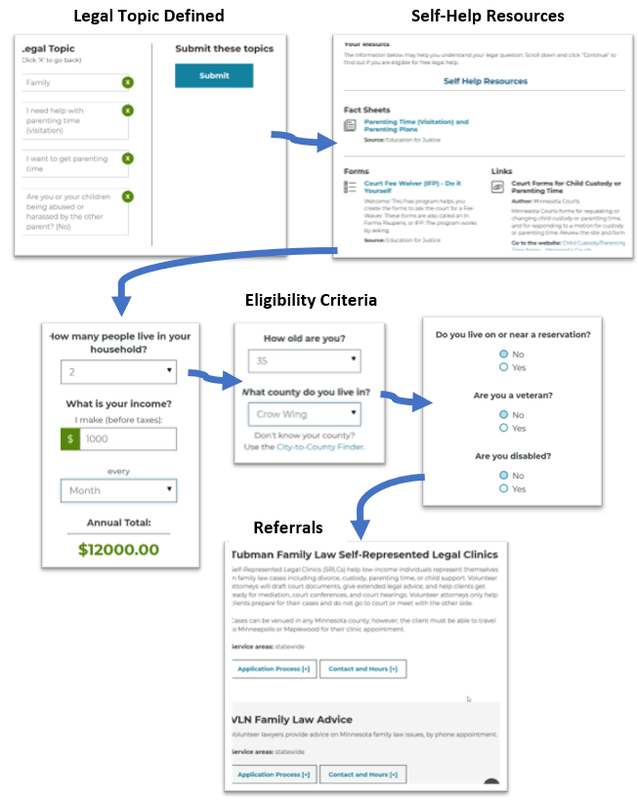 Having sufficiently detailed eligibility information is key to making accurate referrals. The Open Referral data specification includes an open text field which can include eligibility information. Because we needed a standard way to talk about eligibility, we added predefined variables that legal services staff use to describe their service. These include income limits (in the form of Federal Poverty Guidelines), age ranges, and whether a person has a disability, lives on a reservation, or is a veteran. 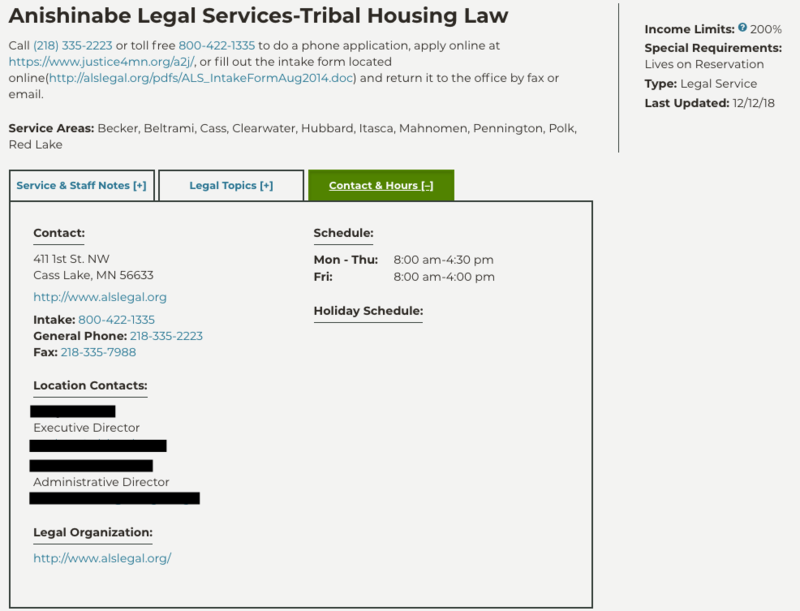 Organizations can include additional eligibility details in the service description or in a field called “Staff Notes” (which is not part of the Open Referral standard) that is only viewable by legal services staff using LOON. Minnesota is fortunate to have a broad array of legal clinics, which form an important part of the legal services delivery system. However, these clinics tend to have schedules that aren’t daily but rather weekly or even monthly. This schedule formulation isn’t currently articulated by the Open Referral data specification. So we’ve created a new “clinic schedule” tab in our Open Referral implementation. This tab records recurring clinic schedules by gathering recurrence type (weekly or monthly), day of the week, and for monthly clinics, week of the month. This, combined with the times of the clinic, allows us to integrate clinic schedules within the Open Referral structure. We suggest that the Open Referral Initiative may wish to consider including the ability for such scheduling in future iterations. After receiving feedback from legal services staff, we added three additional fields: service type, keywords, and a “pause” function. Service type includes five predefined choices – Legal Service, Legal Clinic, Mediation, Referral Service, and Informational Service. This helps the public and staff making referrals know what level of service is available. The second addition is a keyword field that improves search functionality. This is particularly important for organizations that assist very specific client populations not captured within the standard eligibility fields. For example, one Minnesota organization helps cancer patients with a wide variety of legal problems. While “cancer” isn’t one of the predefined eligibility criteria, if a user searches “cancer” on the site or in the provider directory, the organization will be the top return. Finally, organizations can “pause” referrals to a service by setting the service to Inactive. The service will appear in LOON search results but other organizations will know the service is not taking new clients. Inactive services will not appear to the public on LawHelpMN. One organization recently used this feature when several staff were out over the holidays, allowing them to signal to other organizations that they would be unable to complete additional intakes until a later date. A key reason Open Referral appealed to us is that it was built with an eye toward integration with other systems. While we are still focused on refining the database, we have big plans for integrating the information in LOON with other systems. Our first integration was with Drupal. We began by populating a tabbed Google Sheets spreadsheet with organizations’ information in the Open Referral format. Our web development team, Electric Citizen, then imported this information into a custom Drupal database. The development team created an easy editing interface that organizations can use to keep their information up-to-date and add new services, right from the website. In 2019, we plan to integrate an online intake system so when users receive legal referrals from the LawHelpMN Guide, they can choose to complete a short contact form and submit an online intake to participating legal aid programs. We hope to integrate this online intake system with LegalServer, and to explore other LegalServer integrations in the future. We also hope to integrate with additional legal resources and other kinds of services in Minnesota. For example, the Minnesota State Bar Association recently launched the Unbundled Legal Services portal, powered by Community Lawyer. As those in the Access to Justice community are well aware, legal aid organizations often don’t have enough resources to serve all those in need of legal help. Unbundled legal services, in which a lawyer assists with a discrete part of a case, can be a cost-effective way for these clients to receive legal assistance. Our website currently links out to the Bar’s Unbundled Legal Services portal, but we hope to one day create an integration that saves the client from having to enter their information twice. Open Referral has already proven to be a useful and adaptable method for organizing and sharing resource directory information, and we are excited to see what new developments and integrations await us!